And what better to start off my August cooking blitz than one of my all time favourite foods to prepare: SOUP! I chose to share this recipe because while its very simple, it involves one truly magical element that makes the whole dish shine: Fennel! Fennel is one of the BEST whole foods to eat when it comes to good digestion and for reasons I am sure you understand I very much encourage vegetarian/flexitarian/vegan-folk (who eat loads of whole grains, beans, spicy food and soy) to incorporate more of this crunchy-sweet veggie into your diet. 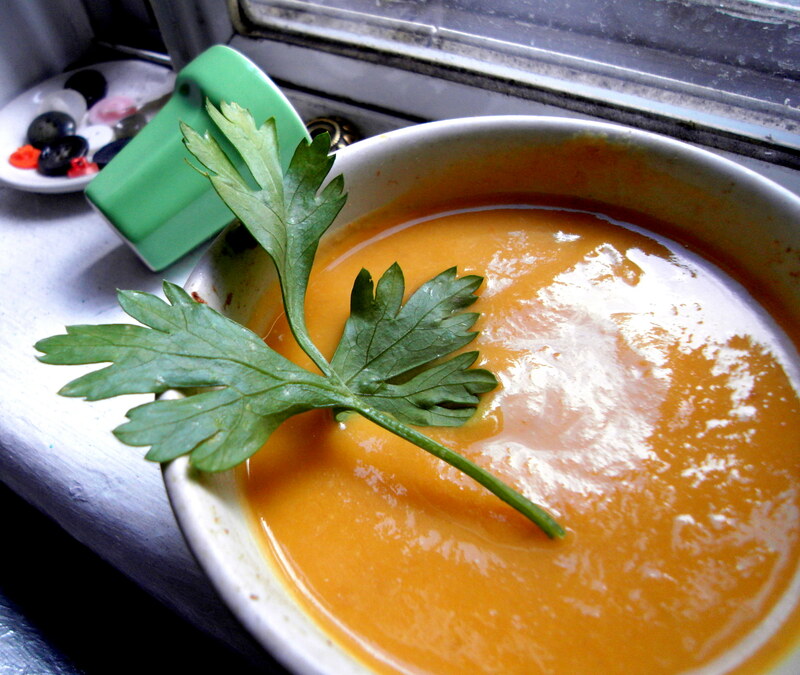 This carrot-fennel soup is simple, subtley sweet way to do just that. Try it out! Trust me your grumbly bloaty tummy will thank you. Sautee fennel, carrots & onion in oil in a medium-large pot until soft and fragrant. Add garlic and sautee another 2-3 min. Add apple, stir to combine. Add bay leave plus 5 cups vegetable broth or water + boullion. Simmer on low for 30-40 minutes until very fragrant. Remove bay leaf and add salt and pepper, almond milk and tofu or yogurt. Then blend. You can do this using an infusion hand blender or scoop into a regular blender. Return to the pot and simmer, season again to taste. Serve with chopped parsley. tricks of the trade: how to make it to brunch! This looks good!!! Come and cook for me!!! I made this last night and it was delicious! The main thing is that I wanted the fennel taste to be stronger, so next time I might roast the fennel rather than cooking it with the carrots on the stove.